This "Lion Arrives In Venice" tapestry shows a fanciful scene of the winged lion stepping onto the shore of one of the Venetian islands. 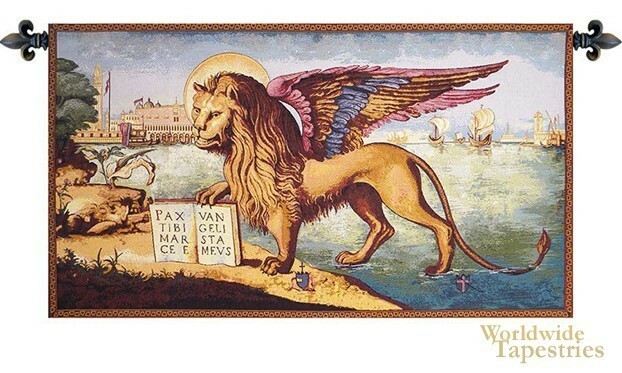 The winged lion is a tradition symbol of Venice, and symbolizes Mark the Evangelist who has been Venice's patron saint since 828 AD when his remains was brought to Venice from Alexandria in Egypt. The symbol of the lion can be found everywhere in this city of canals, from the clocktower in Piazza San Marco, to the Palazzo Ducale atop a column in the piazzetta as well as lion carvings throughout the city. Here we see the glorious lion with his mauve, red and blue feathered wing. A halo also graces his head to symbolize holiness. This fine art tapestry "Lion Arrives In Venice" is backed with a lining and has a tunnel for easy hanging. Note: Tapestry rods and tassels, where pictured, are not included in the price. Dimensions: W 49" x H 26"